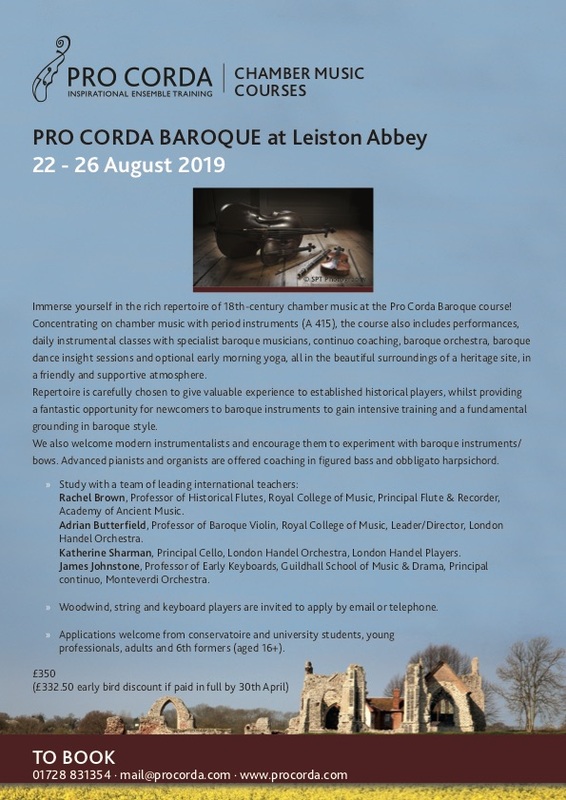 Pro Corda Baroque Chamber Music course offers a fantastic opportunity for players to immerse themselves in the rich repertoire of 18th-century chamber music! I hope this will be of great interest to you. Taking place at Leiston Abbey in Suffolk, August 22-26, the course concentrates on chamber music with period instruments (A 415), but also includes performances, daily instrumental classes with specialist baroque musicians, continuo coaching, baroque orchestra, baroque dance insight sessions and optional early morning yoga, all in the beautiful surroundings of a heritage site, in a friendly and supportive atmosphere. Repertoire is carefully chosen to give valuable experience to established historical players, whilst providing intensive training and a fundamental grounding in baroque style for newcomers to baroque instruments. We also welcome modern instrumentalists and encourage them to experiment with baroque instruments/bows. Advanced pianists and organists are offered coaching in figured bass and obbligato harpsichord.